As the weekend is drawing to a close I have been reflecting that we hadn’t done much of note. Then I reflected a bit further and realised that we had actually achieved a number of things over the weekend, and that they were worth noting! I was trying to work out why I thought we hadn’t done much, and then realised that for the main, the things that were the most important to me are in fact very simple things. Over the last week, with a combination of very hot weather, very tired children and some background stress from our friend’s emergency I have been letting the children have much more screen time that I would usually. Yesterday morning, after the children’s swimming lesson, I was negotiating once again with the boy and the eldest chick about who could access the computer and who could play on the Wii when it struck me that I had lost control of the house! So I promptly announced that all screens were off for at least two hours, but probably longer. After the initial 2 minutes of complaining, and the boy trying to trick me into letting him on a screen 5 minutes later, they all went off and found things to do. 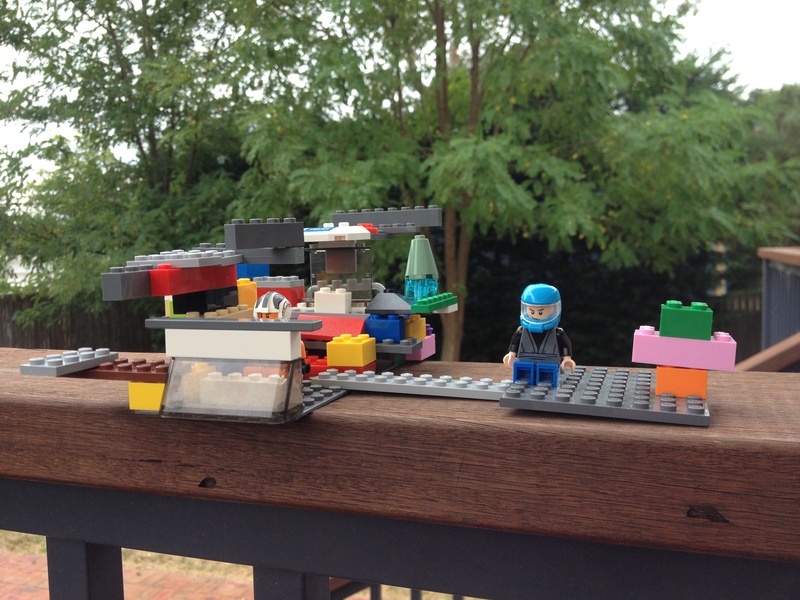 The boy set up a very complex Lego scenario in his room, which involved lots of instructions from him to ‘his men’. 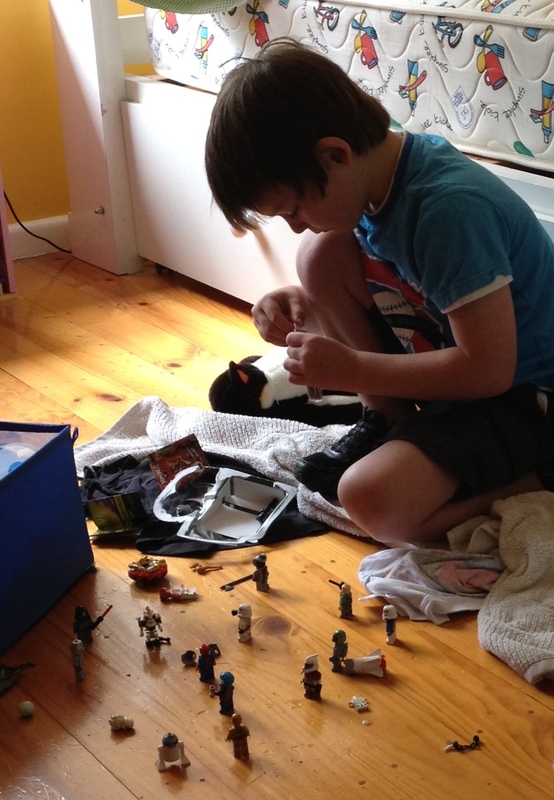 The he built a “Millenium Falcon” and told me that it was built to look after me, as it was made with his love in it. Oh my boy – he is so sweet despite his amazing energy levels. 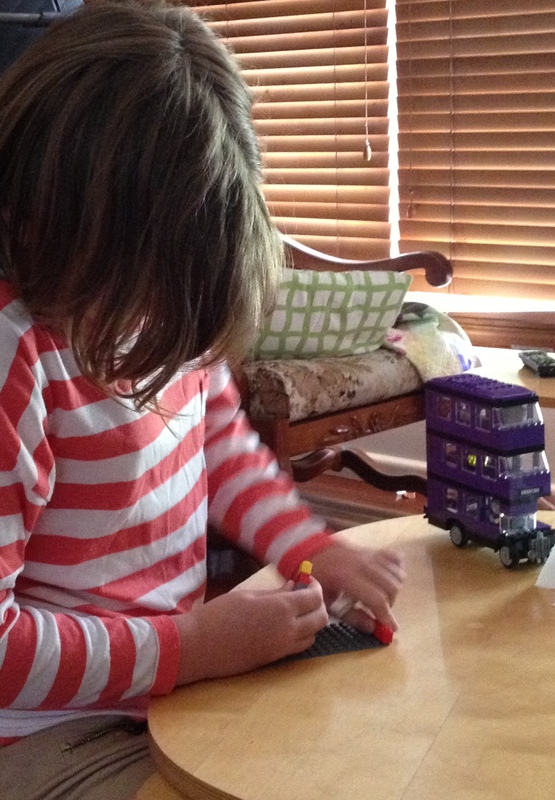 The eldest chick also started building with Lego, and after repairing her Knight’s Bus, took a shoe box, some tissues and a pile of Lego figures and was playing her own quiet but apparently very complex game. The middle chick decided that she needed to create (hence me referring to her as my artist in residence – it is almost a compulsion!). 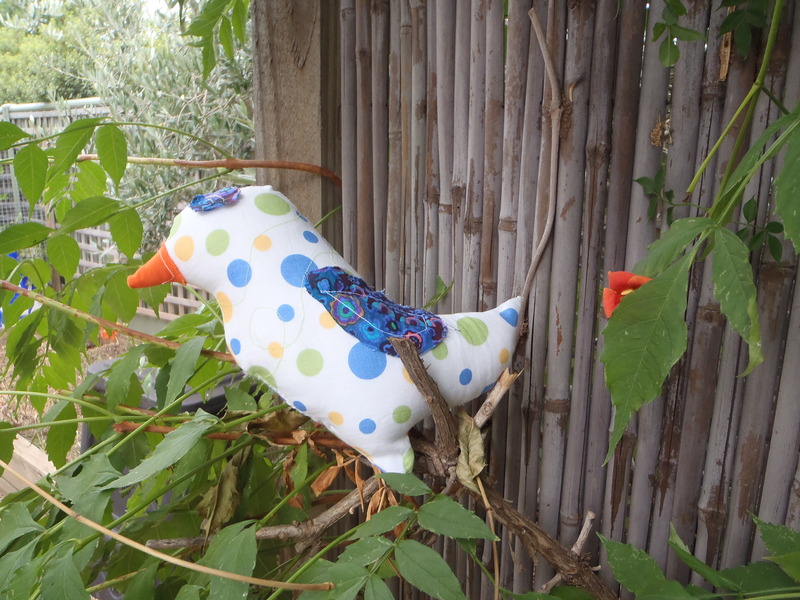 She drew another bird, based on the one she drew for me to use on my packaging tags (in my last post) and decided that she wanted to make it into a stuffed toy. So with some instruction from me on the order of things, she did! Such simple things, but all of them were using their imaginations, which is the true joy in these activities. In the afternoon when they were getting ratty I put them all in the car and we went and found 4 new geocaches. They loved it! The boy had to be hoisted by his mother to reach one tiny micro-cache, which he was thrilled by. Another cache was disguised as a piece of chewed gum stuck under a table (ewwwwww!) and another was a multiple hide, involving us bashing around in the bush, finally finding a panel in the grass to lift, then in the dirt another panel to lift before we finally found the cache. Again the kids were so intrigued by the sneaky hide that the time in the bushes, worrying about snakes etc, was worth it! One cache defeated us, so we will have to return another time and try again. This morning, with no swimming lessons, we all slept in – another simple thing that gave me great joy!! After a cup of tea with a beautiful friend, I had the afternoon to myself while the children were out with their father, so I played with my new toy. I haven’t found a name for the sewing machine yet, but one will come, I am sure! It is such a joy to sew with! Blanket stitch for applique is so neat and smooth! 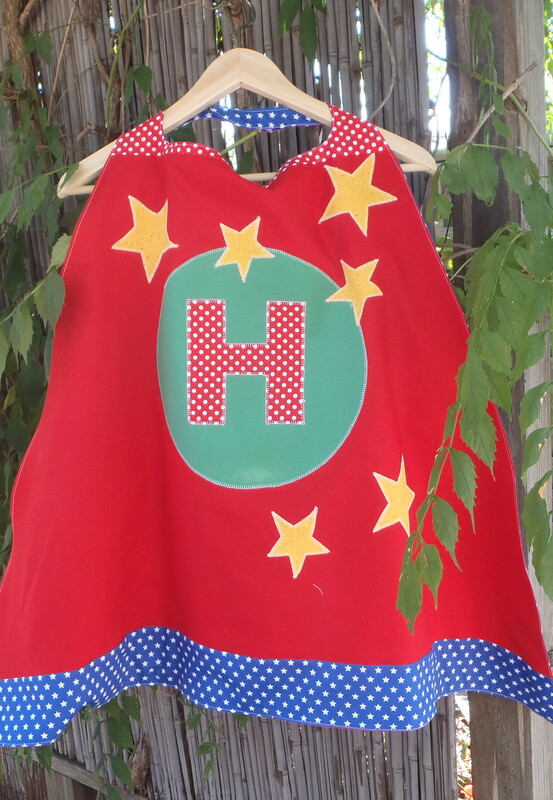 So I made a new super hero cape for a friend’s son. The applique was so smooth I added a few more stars….. just because I could! I also finished the present I am making for the eldest chick and am very happy with the way it turned out. Photos will of course follow once her birthday has passed! 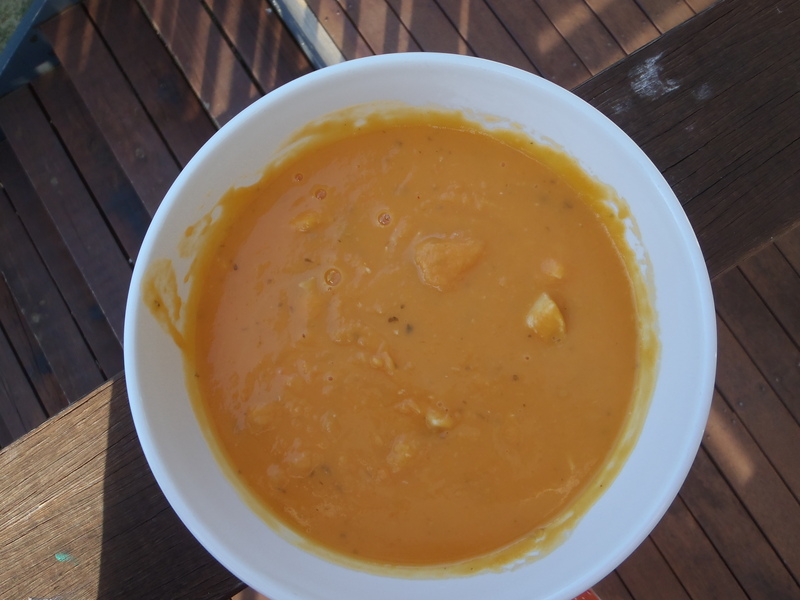 My next simple joy was the bowl of delicious Thai-style sweet potato soup with chicken that a lovely friend had dropped off to me earlier in the day. The colour alone was joyous and then I tasted it – mmmmm mmmmmm. Simple things but lovely things. I then started to complicate things by dreaming of creating my own fabric to make ‘things’ from, planning toys that I could make, fabric labels……and started playing on our paint editing software……so now both the eldest and middle chicks are busy trying to get in on the action, with great ideas of what they will design and then have me make things from…….ah well, technology had to intervene sometime! So – how was your weekend? Happy I hope! 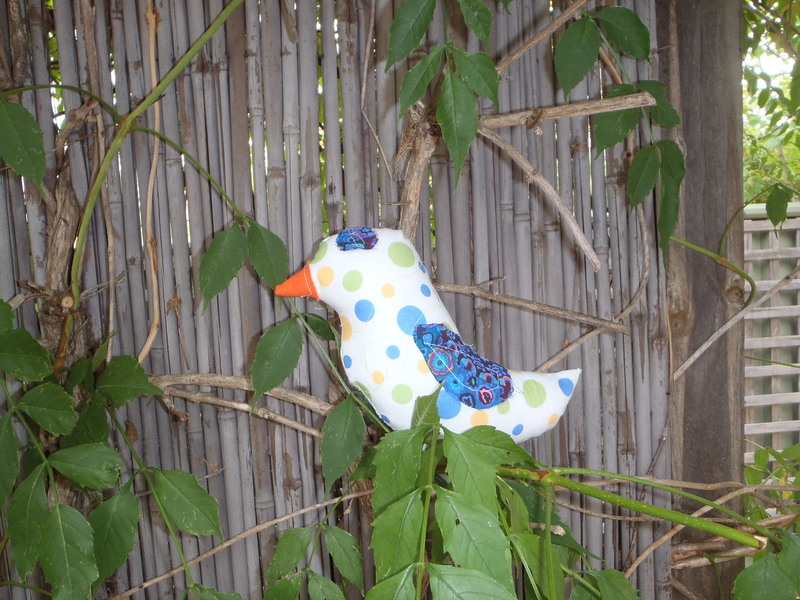 This entry was posted in Sewing, Uncategorized and tagged capes, family, Food, Geocaching, Sewing on January 20, 2013 by a little bird made me. I have a little boy Who is also full of energy, he never stops but at the same time so caring. Your daughters bird looks so professional, well done. Ah yes – the little boys who go non-stop. I think they are made this way, with the balance of energy and love because if they just had the energy their parents would go insane! I passed on your compliment to my daughter – she is very chuffed! And of course is now planning her next sewing adventure!